1. Flexible seating capacity – booths typically allow four people to sit comfortably. However, groups of five or six can easily be accommodated in a pinch, either by adding chairs to the booth end or by getting cozy with one another on the provided benches. 2. An intimate dining experience – booth seating creates the effect of a barrier between guests in your restaurant, allowing them to carry on private conversations and enjoy each other’s company, even with a full house. 3. Greater payoff per table – studies have shown that patrons who sit in booths tend to spend more per visit. Take, for example, this study finding published 3 January 2012: “Customer checks revealed that patrons in booth seating spent an average of $56.67, while customers who sat at freestanding tables spent an average of $38.92.” That difference can really add up at day’s end. 4. More patrons per square foot of space – due to their ability to go back-to-back, restaurant booths actually have an overall smaller footprint than a table-and-chairs configuration. Also, there’s no need to take into account the additional space needed to pull out chairs or walk between them. Customers with disabilities will find that they can easily be seated at the booth’s end, ensuring that your business is taking steps toward ADA compliance. 5. Kid-friendly dining experience – booths give parents the ability to confine children between adults, as well as provide the extra space needed for kids to wiggle, squirm, and expend excess energy. Kids are often more comfortable sitting on the padded benches as opposed to on chairs that are adult-sized, and high chairs can easily be added to the end of a booth. 7. Custom designs – restaurant booths are often custom made to your specifications. Booth seating can be basic, high-end, or somewhere in the middle. 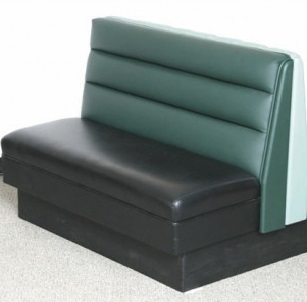 Variations include upholstery, wood stains, trim options, and style of the booth itself. Contract Furniture Company offers fully customizable, made-to-order, affordable booth seating that’s made in the USA – check us out!